Choose life. When in doubt, when you are not sure... When there is a question choose life. The question of Insure Tennessee is a question of whether or not we will choose life. It is not a question of a better way to choose life. It is not a question of not this but that. As more and more stories pour in it is obvious. For thousands of Tennessean it is increasingly each day a question of life or death... a question of life or needless and preventable suffering... a future of hope or one bound by despair. It is not about finding an answer. It is about the common sense and political will to grab the one (the only one) in front of us and stop the unnecessary misery that defines the lives of so many vulnerable Tennesseans. Chattanooga voted last night to choose life. Their city council voted overwhelmingly in favor of a resolution supporting Insure Tennessee. They joined a growing movement of cities and towns saying they support their neighbors, their friends, their families. No one should have to unnecessarily suffer or suffer as a direct result of governmental policy. Insure Tennessee. The movement is growing. Thanks to the leadership of people like Pam Weston in East Tennessee and Meryl and Randall Rice in West Tennessee and the stories and words of more and more Tennesseans the movement is growing. It is the growing crescendo of more and more ordinary Tennesseans saying "CHOOSE LIFE!!!!!" Imagine a flood, a hurricane in Tennessee. The waters are rising.. People are dying.... Many are on top of their houses waiting for a miracle.. a boat... a something... someone who cares.... hope. The government has boats. But they decide to wait. "Let&apos;s make sure this is a good idea..."
The waters still rise. For some it is too late. For others it will soon be too late. Action matters. The hurricane is here for thousands of Tennesseans. And they are on top of their houses waiting. Join the movement to choose life. Talk to your local government. Ask them to join Chattanooga and the other towns and counties that have acted. Today. Today please choose life. Thanks to BP magazine for shining a bright light on a dark topic. I am glad to be a part of a support group that helps prevent suicide. For over 13 years our group has served the Jackson, Tn. community faithfully. "Thank you" to , A Better Tomorrow inspirational support group. Across the country, school districts are providing mental health awareness and suicide prevention training for teachers and school personnel. Some are mandated or encouraged to do so by state law, others are motivated by recent incidents, and some introduce this kind of education because suicide is now the second-leading cause of death among youth aged 15-24. Teacher and parent training are key components in any plan to address teen suicide. Increasingly, however, communities are recognizing that kids need to learn about mental health, too. Social and emotional learning across the lifespan reduces risk factors and promotes protection factors for violence, substance abuse, negative health outcomes, and suicide. One way to provide universal student training is by including a mental health component in the standard wellness or health curriculum. School districts and individual schools can implement individual, more targeted programs as well. Knowing how to cope and developing resilience are at the core of mental health awareness and suicide prevention efforts being implemented in Massachusetts with children as young as elementary school. The Commonwealth of Massachusetts places a high value on suicide prevention, with dedicated line-item funding in the state budget for the Department of Public Health Suicide Prevention Program. With support from state officials, the DPH has launched suicide prevention programs across the state and for people across the lifespan. There are dozens of programs that schools can use to promote skills development while fostering students’ mental health and their willingness to seek and accept help for mental health concerns. SAMHSA’s National Registry of Evidence-based Programs and Practices and the Suicide Prevention Resource Center Best Practices Registry include searchable descriptions for a wide variety of educational programs. For high school students, the SAMHSA Preventing Suicide: A Toolkit for High Schools has a comprehensive list of programs, but a search of the NREPP and BPR may yield programs added since the Toolkit was published. What can you do? Find out how your school district handles mental health training and emotional skill building for students. If there is not currently a program and there is no interest from school officials, you might work with the parent-teacher organization, local mental health groups, and the local board of public health to raise awareness of the issue, then advocate for implementation of one or more programs. There may be grants available to cover the cost of training or there may be organizations in your community that would help subsidize the program. The bottom line is that suicide prevention requires a comprehensive approach. It’s never too early to start and everyone – families, schools, communities, and peers that create supportive environments; individuals who learn and leverage positive coping skills; and mental and public health systems that treat and prevent risk factors – plays a part. What do you think about the mental health awareness and/or suicide prevention programs that are provided to kids in your community? What role should a school have in developing kids’ emotional and social skills? What steps will you take to improve mental health awareness and suicide prevention in your local schools? Editor’s Note: The Families for Depression Awareness Teen Depression Webinaris an accessible, free resource for training parents, teachers, and others who work with youth to recognize depression, talk about depression with parents and youth, and know what to do to help a young person struggling with depression. Register for the Teen Depression Webinar live with Dr. Michael Tsappis on September 30. Thanks to the MA Department of Public Health Suicide Prevention Program and the Suicide Prevention Resource Center for their support in developing this post. Mother Teresa practiced what she preached, serving her neighbors in great need. In contrast, every year Americans feel they must leave their suffering children "next door" to fly off to an exotic land to do God&apos;s work. Personally, I try to follow these words of the person who epitomized service and devotion to God. I say, thank you, Mother Teresa, for leaving these words of wisdom and guidance. In April 2012, Fred Paroutaud, a California man with no history of mental illness, experienced a psychotic episode. Mr. Paroutaud was hospitalized and diagnosed with bipolar disorder. Just 72 hours after he was admitted, and despite the fact that he was still experiencing hallucinations, he was discharged and referred to outpatient group therapy. Because his condition remained unstable he requested alternate therapy and one-on-one sessions with a psychiatrist. He was denied both by his health plan and his condition deteriorated. Concerned by his worsening depression, his wife appealed to the health plan again and again. She pleaded that her husband required more supervised and personalized treatment. While waiting for an appointment with his psychiatrist, and just two months after his first psychosis, he died by suicide. Mr. Paroutaud’s widow is convinced that if more intensive and timely care had been available, her husband would still be alive. In October 2013, she and two other plaintiffs filed a class-action lawsuit against the health plan claiming they were harmed by its systemic denial of timely access to mental health services. While Mr. Paroutaud’s story is unique, his circumstances were not. Upon his release from the hospital, he needed intensive, monitored care. That’s not what he got. Generally speaking, commercial health plans limit coverage to two levels of care: level one is a once a week therapy visit for mild to moderate problems and medication management; and level two is hospitalization. Those two narrow levels of care are appropriate for many people, but not all, and certainly not for all stages of mental illness. The absence of those critical, in-between levels of care is one of the ways that our mental health system falls short and where it fails people like Fred Paroutaud and his family. When someone is in the midst of a manic episode or considering suicide, hospitalization can provide the opportunity to stabilize the condition. Upon discharge, many patients require medically monitored care in a residential facility or highly personalized care in a medically-monitored outpatient setting. Unfortunately, that level and type of care is almost impossible to find in commercial health plans. My hope for a health system that offers comprehensive mental health services to better address the needs of individuals with a mental health condition is not pie-in-the-sky wishful thinking. In fact, this model of care, with multiple levels and degrees of intensity, already exists within the California Medicaid system. In our public programs, care ranges from community-based health management through low-intensity community-based services, high-intensity community-based services, medically-monitored non-residential services, medically-monitored residential services, and medically-managed residential services (i.e., inpatient treatment). This structure, with six levels of care, is the backbone of the mental health system under California’s Medicaid system, and it provides a complete, stepped approach to rehabilitation. This type of care should not be exclusive to the Medicaid population. One of the 10 essential health benefits under the Affordable Care Act is rehabilitation; another is mental health care. This means that rehabilitation for mental health care isan essential benefit, and all Americans in commercial health plans are entitled to more rehabilitation-focused mental health services. Fred Paroutaud was denied access to stepped treatment and his story is tragic. It is thanks to his widow and her persistence that we know about it at all. Unfortunately, many people suffer similar situations and denials of care, but we do not hear about them. With increased national attention on access to mental health care, now is the time to tell us about the problems you are having in accessing the care you need. We want to know what services you were denied and the barriers you faced, such as unaffordable out-of-pocket costs, transportation issues, or lack of trained providers in your plan’s network, etc. We also need to know what you did or didn’t do in response and how this impacted your or your family member’s recovery. As advocates and advocacy organizations, we are positioned and prepared to knock on the door of government regulators and health plans and point out the disparity in care and demand access to appropriate rehabilitative services. Many commercial insurers don’t cover rehabilitation services because they don’t believe they have to. And if no one demands otherwise, they are unlikely to ever change. Share your story. Don’t take ‘no’ as the only answer. Let’s realize the parity we deserve. How have you been denied equal insurance coverage for a mental health condition? Tell us your story. What levels of treatment are available to you under your health plan? Are they sufficient? Rusty has been Executive Director and Legislative Advocate for CCCMHA since 1987. He is co-author of California’s Mental Health Services Act, a tax on personal incomes over $1 million to expand community mental health care. At CCMHA, he has been instrumental in moving forward a variety of critical mental health-related initiatives, including ensuring the implementation of the federal Early Periodic Screening, Diagnosis, and Treatment (EPSDT) program to serve children with severe emotional disturbances. He also serves as Executive Director of the Mental Health Association in California. · NASHVILLE -- Gov. Bill Haslam has ordered state agencies to slash discretionary spending by up to 7 percent as his administration builds the new budget it will present to legislators early next year. The move comes with the state’s general fund, which pays for most functions of government including education, showing a $302.4 million revenue shortfall for the fiscal year 2013-2014 budget that ended June 30. Administration officials on Friday confirmed the directive given to departments. Agencies’ plans are due Monday. How much actually winds up getting cut and where in Haslam’s fiscal year 2015-2016 budget will depend on a variety of factors. But after years of reductions, Tennessee may be on the verge of having to make tough choices next year, possibly abolishing entire programs, said one top lawmaker. He said the major problem with the state revenue picture is business franchise and excise tax collections. The second part of the directive asks departments to provide a list of base reductions they would use to offset any proposed increase requests in areas officials consider vital. Flagging collections in Tennessee’s two main business taxes have been the main culprit behind recent problems. The franchise tax on business property and the excise tax on corporate income forced Haslam, a Republican, and lawmakers last April to cut $276 million from the fiscal year 2014-2015 budget the governor presented to lawmakers last January. As a result, Haslam, whom many think has national ambitions, was forced into the embarrassing position of breaking a promise he made in his State of the State speech: Providing teachers, state workers and higher education employees with 2.5 percent raises. The total FY 14-15 budget, which took effect July 1, is $32.4 billion and 2.4 percent less than the last fiscal year’s $33.2 billion spending plan. Some $12.9 billion in this year’s budget comes from the federal government, according to a legislative analysis. Last week, Haslam and other top officials were in New York where Wall Street’s three major bond rating agencies voiced concerns about problems with Tennessee’s business taxes. “Because that was the cause of our shortfall, there were quite a bit of questions about that in terms of cause and whether we see a long-term trend there,” Haslam told reporters in a conference call Thursday after meeting with Fitch Ratings Inc., Moody’s Investors Service and Standard & Poor’s Financial Services. The governor said part of the franchise and excise tax declines were due to overpayments made last year by businesses, which make payments in advance based on estimates. Haslam mentioned nothing to reporters about the latest efforts to “adapt” with the spending cut directive, which the Times Free Press obtained a day later. The administration was put on the defensive last spring by legislative Democrats who said figuring out the problem with franchise and excise taxes should be a fairly simple thing. Rep. Mike Stewart, D-Nashville, said all they had to do was take a look at the top 50 corporate payers of the tax. State Revenue Department officials are now studying the problems, with recommendations expected in January. But a Nashville-based tax attorney, Brett Carter, agreed with Stewart last spring in an article he wrote for State Tax Notes, a national publication. And Carter thinks he’s figured it out a “likely” answer to the cause that indeed does appear fairly simple. Using publicly available court documents, Carter points to the 2012 relocation of McKesson Corp.’s Southeastern pharmaceutical distribution center from Memphis across the state line to Olive Branch, Miss. Tennessee tax policies had previously resulted in litigation and Carter delved into the material. Carter said the companies may have been paying more than $150 million in Tennessee franchise and excise taxes and saw a major opportunity to slash their costs by moving to Mississippi, which has lower taxes. McNally said state lawmakers are looking at that and ways to restructure the taxes. Contact staff writer Andy Sher at asher@timesfreepress.com or 615-255-0550. Larry and Linda Drain are quiet, unassuming people. But when circumstances arose that threatened Linda’s life, they both began speaking out, their voices ringing loudly to bring awareness to — and a solution for — themselves and others who have fallen through the cracks of the health care system in Tennessee. Their income is too high to qualify for TennCare, Tennessee’s public insurance program, and too low to qualify for federal subsidies under the Affordable Care Act, also called Obamacare. The event honoring the Heroes was part of the Tennessee Health Care Campaign’s 25th Anniversary celebration. In addition to the Drains, Laura Sell was honored for the major work she did as a volunteer to promote and support enrollment in the Patient Protection and Affordable Care Act, collaborating with the Blount County Public Library. The story began with Linda, who has been drawing Supplemental Security Income (SSI) for some time because of epilepsy, brain surgery and additional health conditions. Larry said, “She has TennCare. She has to have the TennCare in order to live. If she does not have the medication, if she doesn’t have the medical care, she will die. After Larry turned 62 last September, he decided to take early retirement and begin drawing Social Security. “If I had to take all the dumb, stupid, worst things in my entire life that I have ever done, that one is so far to the top that there is not a second place,” he said. “The way we had it figured out, we could live if we took what she made in SSI and what I made in retirement. We weren’t going to be rich — in fact, we were going to be poor — but we would be able to pay our bills, do what we needed to do. We were going to be OK.
Larry began drawing attention to the need for TennCare expansion by writing a series of letters to the governor. Some were very personal, some general and policy oriented, but in each letter, Larry pleaded with Haslam to submit a plan for TennCare expansion. The 100th letter was emailed on Sept. 2. As of that date, the governor had not responded to the Drains, but he did announce on Aug. 28 that he plans to submit a proposal to Washington to expand Tennessee’s Medicaid program. He did not release any details, however. Larry said more than 1,200 individuals from across Tennessee have told him they also contacted Haslam. Larry’s 100th letter to the governor begins to list the names, and he plans to continue adding names in subsequent letters until every one is included. Each letter is available atdeargovernorhaslam.wordpress.com and is viewed by 4,000 to 6,000 persons daily. In addition, a petition entitled “Gov. Haslam: Expand TennCare and Let Me Stay With My Wife!” at www.thepetitionsite.com has almost 46,000 signatures in support of the Drains. Twenty-five miles separate this couple now. Linda is in Knox County, while Larry is in Blount County. They are waiting for the time when they can once again live together as man and wife without Linda losing her life. Gov. Bill Haslam said Thursday that the state may soon submit a proposal to Washington to expand Tennessee’s Medicaid program but did not release any new details on how it might work. I wanted to give each of you Allen Doerderlein&apos;s Tennessee visit intenery as it is known now. More details of all events will be shared as they are organized. Everyone is invited to attend all events,and encouraged to do so, wherever the event is being held. I know that I am like all of you, eagerly awaiting and very excited about Allen&apos;s visit. Please keep me informed regarding all aspects of his visit as your Chapter creates them. Our Doerderlein Event Committee is hard at work, planning and organizing details for a very productive and successful visit. Thank you everyone for your help with this and more so, thank you for your continued dedicated work for all those that live with mood disorders in Tennessee. Couple forced to separate after 33 years of marriage! It was supposed to be one of the strongest tenets of the 2010 Patient Protection and Affordable Care Act. Instead, it became a political football, a metaphor for states’ rights. After the Supreme Court ruled that the ACA could not force states to expand Medicaid, Gov. 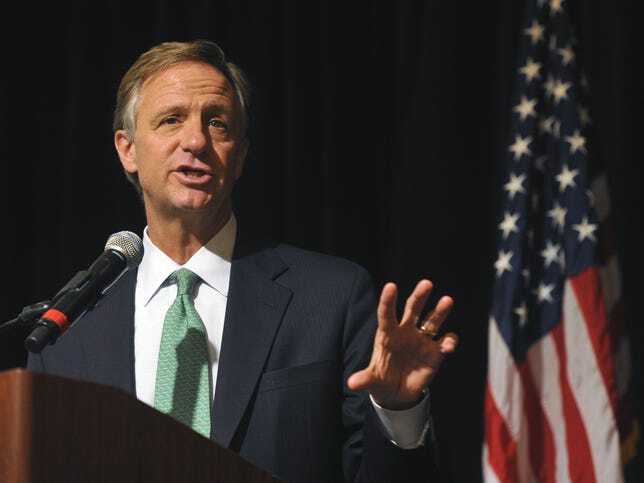 Bill Haslam was among those who rejected the Medicaid expansion, instead offering his alternative “Tennessee Plan” for federal government approval. But whether the federal government and the General Assembly will accept Haslam’s plan remains to be seen, along with how well it will work to cover those who currently don’t have health insurance. “He’s either politically brilliant, or he’s making one of the worst mistakes he could make,” Rep. Joe Armstrong, D-Knoxville, told the News Sentinel in March. Originally, the Medicaid expansion provision was to give state health insurance coverage to a group of people who made too much to qualify for Medicaid but too little to afford insurance on the health insurance exchanges, even with the planned government subsidies. It expanded Medicaid to qualify people younger than 65 whose income is below 138 percent of the federal poverty guideline (a little more than $15,860 annually for an individual, a little less than $32,500 annually for a family of four). It meant that, for the first time, low-income adults who don’t have children could get state Medicaid coverage, and it standardized other qualifications. Many states, including Tennessee, limit Medicaid enrollment to certain categories of people. To qualify for TennCare, for example, you have to be low-income and pregnant, a child, blind, disabled, aged, or fall under multiple, specific categories. Tennessee has nearly 1 million uninsured residents, of whom at least 140,000 and maybe more than twice that number, by some estimates, likely would enroll in Medicaid if it were expanded under the ACA guidelines. About three-quarters would have been previously uninsured. Under the ACA expansion, the federal government would pick up the entire cost of new, previously ineligible enrollees for the first three years, phasing to 90 percent by 2020. In Tennessee, federal funds would have amounted to about $1.4 billion in the first year alone. States could receive federal matching funds for covering additional low-income residents under Medicaid as early as April 2010, with wide-scale enrollment beginning this October and coverage starting Jan. 1, 2014. However, in June 2012, the U.S. Supreme Court ruled that the federal government could not make states expand Medicaid — making a linchpin of the ACA optional. So far, 20 states have moved forward with Medicaid expansion. Ten have rejected it outright, while 10 others are not doing it now but are looking at alternatives and have not ruled it out for the future (the government gives no deadline, though states waiting much longer to decide stand to lose federal funds for the first year). Three states are still undecided, while seven — including Tennessee — are crafting their own, alternate plans. On March 27, Gov. Bill Haslam announced that Tennessee would not expand TennCare rolls under the ACA, instead offering up an alternative he called the Tennessee Plan. “I don’t think just pure expanding of a system that we all agree is too costly for us, is too costly for the federal government to afford long-term, is the right way,” he said then. Haslam’s proposal is that the state use federal funds not to expand TennCare but to purchase private insurance through the insurance exchange for people who would have qualified for coverage under Medicaid expansion. Individuals identified as being eligible for the Medicaid expansion group would instead be directed to the exchange, where they would be allowed to choose any qualified health plan that offers a certain level of benefits (the Silver Plan). The state would pay the monthly premiums, matchable with 100 percent federal dollars, for those people to enroll in the Silver Plan. People in the Medicaid expansion group would be treated like all other people enrolled in the Silver Plan, with access to the same benefits and appeals process as other people in the plans. In addition, Haslam would seek to reform the way providers are paid for services, with payment based on outcomes rather than a set fee for services. The money saved, he said, would be enough to cover the state’s 10 percent share of costs after the government’s share goes to 90 percent. But the federal government may not allow Haslam to forgo some of those requirements. While national Centers for Medicare and Medicaid Services guidelines indicate that the main tenets of the plan — using federal dollars to pay premiums for low-income people to have commercial insurance, and reforming payment — meet federal requirements, some of the details don’t align with federal requirements intended to protect Medicaid enrollees. For example, Tennessee would need to give those with serious health conditions a choice of enrolling in TennCare or private insurance, unless CMS were to grant Tennessee a waiver to that requirement. The federal government would require supplementation of benefits (sometimes called “wraparound”) to make sure the commercial insurance plans include all services that would be available through Medicaid. Hypothetically, this could be done through a supplemental premium to the Silver Plan insurance provider. The government also limits co-payments for Medicaid-eligible enrollees. There is also an appeals process in place, required by past Supreme Court rulings, so that Medicaid patients and their doctors can challenge insurance companies’ refusals to cover “necessary treatments.” Under federal law, Tennessee would have to allow Medicaid-eligible patients this due process. Haslam’s plan is modeled on a plan by Arkansas, which also wants to use federal matching dollars to pay commercial insurance premiums for those eligible for the Medicaid expansion. But while Arkansas got legislators’ approval before approaching the federal government, Haslam has taken the opposite approach, presenting his plan to CMS first. Haslam did not ask state legislators to vote on whether to take the federal Medicaid expansion funds this session, though he said he has not ruled out calling a special legislative session later this year to meet federal deadlines for the health exchange enrollment starting in October. The Medicaid expansion is the only provision in the ACA that provides insurance coverage specifically to those between 101 percent and 138 percent of the federal poverty guideline. If Haslam fails to reach an agreement with the federal government, or does not opt to accept the federal Medicaid expansion plan (which he could still do), that population likely would remain uninsured. However, the latest word among hospital executives and advocates is that an agreement could be near. “I think (Health and Human Services) Secretary (Kathleen) Sebelius is really eager to find some alternative plans that meet the goals of the ACA but do so in creative ways and allow states to create plans beneficial to those individual states,” said Jerry Askew, senior vice president for governmental relations for Tennova Healthcare. Through Tennova’s parent company, Health Management Associates, Askew works with hospitals in seven states. All of them, except those in Kentucky and West Virginia, have said no to the expansion. Consumer-advocate groups and hospitals were in favor of the expansion, especially since hospitals stand to lose money on uncompensated “charity” care that would have been partially covered, at least, if more people were insured through Medicaid. The Tennessee Hospital Association has said the state stands to lose 90,000 jobs and nearly $13 billion. Having that population continue to go uninsured also means higher costs in the long run, Myers said, as studies have shown that those without insurance are less likely to get preventive or early care. Business writer Carly Harrington contributed to this report. © 2013, Knoxville News Sentinel Co. The opposition to Medicaid expansion is loud, organized, powerful, aggresssive and persistent. Many people believe that the fight is over with in Tennessee. They point to the opposition in the legislature and wonder how they can make a difference. Expansion seems like such a no brainer in so many ways. I cant remember when the state of Tennessee had a chance to do something with the ability to help so many people so much. Yet it seems so far away. It will take people who believe in it speaking up, speaking a lot, and speaking a lot more. Silence will only confirm what is. If what you say matters, saying nothing matters even more. Will you speak up?? There is no assurance it will make a difference. There is no promise you will be heard. The only promise is what will happen if you dont. We need each other. Badly. Speak out. Write. Call. Email. Do something and then support someone else in doing the same. Vote each and every day the matters of your heart. If are voice is to matter then what we do must matter. Speak today for Medicaid expansion. Speak tomorrow and the day afterward. And continue speaking until you are heard and make a difference. If you dont speak for the people in need now who will speak for you in need. Tomorrow will be my 13th letter to Governor Haslam. The day after that will be the 14th. Please join me. Contact Governor Haslam today. DBSA targets raising expectations for mental health treatment. A month-long social media campaign, Target Zero to Thrive, challenges mental health care professionals, researchers, and individuals living with or affected by mood disorders to raise treatment goals to complete remission—to zero symptoms. Of course the first priority for treatment is ensuring a person living with depression or bipolar disorder is out of crisis. However, too often the end goal established for successful long‐term care is for the person to maintain a stable mood. Better, or even stable, is not always well. Every person deserves the opportunity to not just survive but thrive, and to do that we need to ensure true wellness is the end‐goal for mental health treatment. Consider this, successful treatment for cancer proceeds with the goal of removing every cancerous cell—to achieve complete remission. Why then, do we consider treatment for depression or bipolar disorder to be successful when symptoms persist, even if the person is considered to be stable? (1) Am J Psychiatry. 2000 Sep;157(9):1501-4. Does incomplete recovery from first lifetime major depressive episode herald a chronic course of illness? Judd LL1, Paulus MJ, Schettler PJ, Akiskal HS, Endicott J, Leon AC, Maser JD, Mueller T, Solomon DA, Keller MB. (2) J Clin Psychiatry. 2007 Aug;68(8):1237-45. Mood symptoms, functional impairment, and disability in people with bipolar disorder: specific effects of mania and depression. Simon GE1, Bauer MS, Ludman EJ, Operskalski BH, Unützer J. (3) Bipolar Disord. 2004 Oct;6(5):368-73. Burden of general medical conditions among individuals with bipolar disorder. Kilbourne AM1, Cornelius JR, Han X, Pincus HA, Shad M, Salloum I, Conigliaro J, Haas GL. (4) Psychiatr Serv. 2013 Dec 1;64(12):1195-202. doi: 10.1176/appi.ps.201200587. Does response on the PHQ-9 Depression Questionnaire predict subsequent suicide attempt or suicide death? Simon GE, Rutter CM, Peterson D, Oliver M, Whiteside U, Operskalski B, Ludman EJ. Who would be eligible for Medicaid? The issue of Medicaid expansion is a mental health issue. The fact is, we must prepare for the deaths of thousands of our fellow consumers because mental illness is not an attractive topic of concern, not a winning political issue. Let&apos;s face it, mental illness, left untreated, is not a pretty picture. So, mental health care must be made affordable. That&apos;s the reason we need mental health care provided for those who are the most vulnerable and the most desperate for proper mental health care. And, so, here we are . . . are we ready to witness a huge, preventable loss of life? Or, are we ready to call on those we elected to serve us and let them know we expect them to step up and do the right thing? Click on the link. Watch the video. Then you are welcome to click our Forums tab to create the topic you want to discuss. Editor: numerous contributors are personally invited.